Just Mikaeus with as many fun old black cards as I could put in because I love the power/feel of the older cards and I love the old black card frame. I originally had Walking Ballista , Plague Belcher , and Crystalline Crawler for fast infinite damage, sac/death triggers, or Mana but I took them out to lower down the power level (before i bumbed it past what it used to be), so I'm thinking about putting them back in again. Those 3 cards along with the rest in the maybe board are cards that I originally had in that I took out but didn't really get to try them out much to see if they were worth keeping in. Most of the maybeboard is made of cards that were either too slow or not an ability on a creature that I could abuse with Mikaeus, or I just can't think of what to take out for some of them and whether I really want to play a lot of infinites. This build of Mikaeus plays a lot of ramp and a lot of powerful black spells. 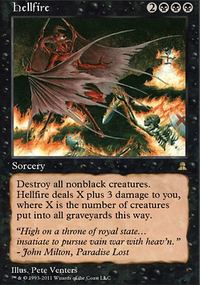 There is a lot of enchantments and high devotion permanents for Gary , nykthos , and Abhorrent Overlord . 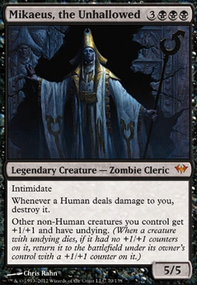 The deck has many synergies and good cards that interact with undying to try to abuse it as much as possible especially retribution fo the ancients which can abuse any of this decks crazy etb creatures such as Sidisi, Undead Vizier , all of the Fleshbag Marauder effects, and the many other etb effects in the deck. I tried to play as many creatures as possible to abuse Mikaeus's ability to have repeatable removal spells, card draw, ramp, and drain life effects which is a key way that this deck wins.